Jory Fleming was a Gold Winner and Rising Star at the 2017 Information is Beautiful Awards with his meticulous & visually arresting work on gerrymandering in the US. A geographer, oceanographer, data designer & Rhodes Scholar, Jory is currently a graduate researcher at the Environmental Change Institute at Oxford University. 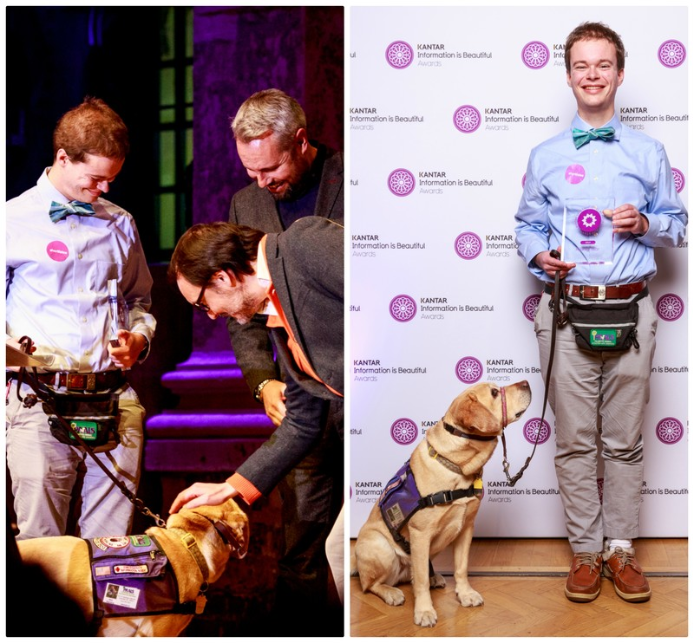 He and his charming service dog, Daisy, were the life of the party at last year's ceremony - read on to see what Jory and Daisy are up to one year later. What inspired you to produce your work on gerrymandering? Did you encounter any difficulties or challenges in the creation? I was inspired by news media articles I'd read about the subject, and seeing the effects in the landscape around me. As a geographer I knew that in many ways the district lines being gerrymandered were arbitrary, but their effects on people are quite real. The main challenge I faced was thinking through how to use visuals to make the issue a bit more exciting, the worst thing that could happen is that someone seeing my creation would have their eyes glaze over! I tried to include little things, like bright colours, fun animations, and interactivity to counteract this. I am heartened to see recent activism on this issue surfacing through things like ballot initiatives. Gerrymandering is inherently non-partisan because it affects everyone - feeling like your voice is represented in Congress is a key ingredient to the success of democracy. I hope visuals can be a continuing part of this story: I firmly believe just about anyone can look at their gerrymandered district and raise questions on why their representation is shared across such a strange geographic shape! How was the experience of winning at last year's ceremony? What was it like being surrounded by other passionate fans of dataviz? I had the wonderful experience of attending the ceremony with my mom. It was our first trip to London since we arrived (Jory had previously been based at the University of South Carolina). For the night, it was amazing to see that all of the people I follow on Twitter are actually real! All of the staff were lovely, and it is great that people from all over the world gathered to celebrate for an evening. What are you up to these days? Any new works? I am in the final year of my graduate program in geography at Oxford University. With two fellow students in my program, I learned about systems mapping and together we made a diagram of deep sea mining for a contest. For most of my time I have been working hard on my master's thesis, which focuses on experimentally observing how people interpret maps in relation to simulated policy choices and decisions. After it is published, I plan to work on crafting a visual story to share what I find from my research. After I wrap up this work I'd love to re-engage with the community and see how visual storytelling can impact the many social and environmental challenges we see around us every day. I'm always open to discussing ideas and projects, feel free to reach out! Gerrymandering: A Nation Divided, but Who's Drawing the Lines? Daisy is deservedly the real star whenever we encounter anyone. While perhaps less interested in data visualisation, Daisy loves seeing new places and we've had the joy of exploring all the hidden nooks and crannies of Oxford and the UK this past year.